DOWA-IBI designer starts own firm in middle of construction of new high school in Troutdale. The architect who designed the huge remodel of Reynolds High School left his architecture firm — and the firm left Reynolds School District high and dry. On Wednesday, Oct. 25, the Reynolds School Board formally declared an emergency in the situation to give the district flexibility while the district sorts out its next steps. The exit of DOWA-IBI architects could "create substantial cost to the district," Rachel Hopper, Reynolds chief financial and operations officer, told the board. Dan Hess, a principal architect with the Portland office of DOWA-IBI group, left to start his own firm called Bric. The DOWA-IBI project manager, Nancy Rad and project architect Robert Allen also joined Bric, along with others from DOWA-IBI. "It certainly wasn't my intention" to leave Reynolds in the lurch, Hess said, adding that the situation left them "in a difficult position for sure." The district's understanding is that the Portland office of DOWA-IBI will be closed. Hess said he did not know what will happen to the DOWA-IBI Portland office. Repeated calls to the Portland DOWA-IBI office were not returned. The DOWA-IBI Group's web page has been scrubbed of most of its content. Admitting that this is an "unusual" situation, Hess said he is negotiating with Reynolds on a contract for Bric to finish up the work at Reynolds High School. "We're just honored that the district wants to continue to work with us and we really, really appreciate it," Hess told The Outlook. DOWA-IBI has designed many schools and other buildings including Portland's "new" Franklin High School. The recent DOWA-IBI departures have also left other school districts in the lurch, mid-construction, including Sherwood, North Clackamas and Seaside. Hess said Bric is talking with these districts too. North Clackamas spokesman Jonathan Hutchinson, said the district is "exploring our options," but declined to give any details. 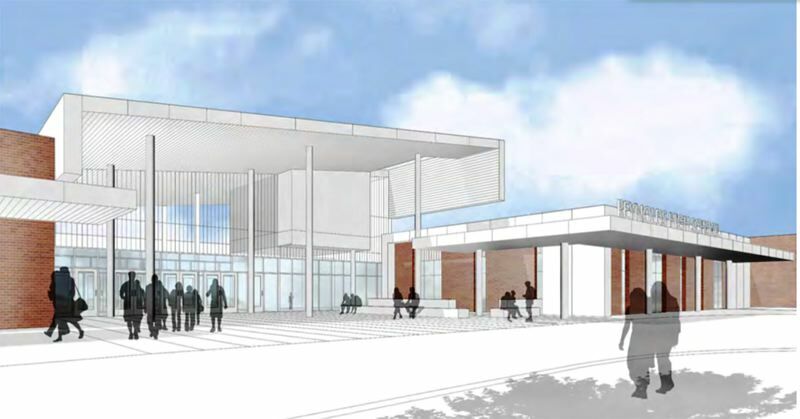 In North Clackamas, DOWA-IBI was designing the replacement for Milwaukie High School, a new yet-to-be named elementary school, a health center at Rex Putnam High School and projects at two other schools as part of a $433 million facilities bond building program. The value of the DOWA-IBI contract with North Clackamas is $11.3 million. Projects in the North Clackamas district are not as far along as Reynolds High. Construction on Milwaukie High School was not scheduled to start until March 2018, for example. Sherwood and Seaside districts did not return The Outlook's calls to discuss their situations. The Reynolds High remodel is part of a $125 million bond voters passed in 2015. The school is getting a major overhaul and a new wing of science and general classrooms. The several separate buildings that make up the campus are being connected. Administrative, counseling and other offices are being relocated and upgraded. The school's 2,500 students are attending school in the building during construction. It is scheduled to be completed by fall 2018. Hopper told the board Oct. 25 that Hess left the firm in September, but "the team continued working on our project, and this week the high school project architect is leaving the DOWA-IBI firm and our understanding is that the remainder of the DOWA-IBI team working on our project are also leaving the firm." She said "DOWA-IBI did not assign new team members to work on the district's project." Reynolds' declaration of emergency allows the district flexibility to find new architects to finish up the project. The board's declaration authorizes "direct appointment of architecture and engineering services as a result of the unforeseeable loss of project team members by DOWA-IBI who were not replaced." "The local office was basically disbanding, and we obviously have some serious concerns about this," Hopper said. Although the design of the project has long been finished, and the high school project is under construction, there are myriad details, such as approving substitute materials, that the architects need to handle to finish up a building. The Reynolds board's resolution warned of a "substantial risk of interruption of architectural services with which would result in significant loss to the district." The district's contract with DOWA-IBI was for $2.5 million, and the payment situation is not yet clear. "This is not a position the district wants to be in," Hopper said. "There are a dozen items sitting there waiting for an architect to deal with," she said. "We're already going to lose about a week or two weeks."